High-resolution art from the Dungeons & Dragons 5th Edition Player's Handbook has been released. The revealed pieces of artwork depict a high-elf wizard, a wood elf forest city, the Cloudkill and Mordenkainen's Sword spells, a party of adventurers confronting a dragon in its treasure-filled lair, and the cover of the Player's Handbook. 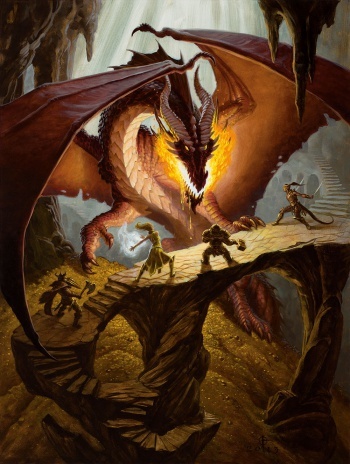 While a spectacular piece of artwork, the cover doesn't quite capture the spirit of D&D the way the aforementioned dragon image does, feeling instead like generic fantasy art. The Warlock's two-page spread is revealed, including artwork and the preliminary descriptions of the class. I never liked the idea of the Warlock being a core class, but I must say that the concept has grown on me since 4th Edition. Distinct from wizards and sorcerers, warlocks are magic users that are bound by a pact to an otherworldly being, be it a demon prince, an archdevil, or a fey lord. I was pleased to see the return of artist Wayne Reynolds, whose work graces the cover of the 4th Edition Player's Handbook, accounts for some of the most memorable pieces of 3rd Edition artwork, and heavily influenced the overall look of Pathfinder. His distinct style and flair for dynamic poses make his artwork instantly recognizable. If I have one qualm, it's the huge disparity between the various art styles. I feel as though 3rd and 4th Edition had more cohesive art directions - but maybe my memory is just being selective. The first of the three core rulebooks to be released, the Player's Handbook will hit shelves August 19. The Monster Manual is scheduled for a September 30 release, and the Dungeon Master's Guide is coming November 18. Which edition had your favorite artwork?